Harpus is a large feathered Harpy-type Bakugan. His battle strategy is to provoke and make fun of opponents to make them lose focus in battle. He has an arrogant and argumentative personality. He shares a strong bond with Komba and is his guardian. 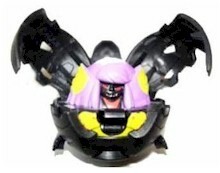 Harpus is a powerful bakugan. Even though it has good mobility it can sometimes seam cocky and annoying due to abilities. Purchase Harpus from Amazon now!